You saw him in full clown makeup for last year’s It. Here, Bill Skarsgård goes a bit more subtle on the set of Shawshank State Prison, where his nameless mystery character is incarcerated. “I used extreme contouring with highlights and shading to make him pale and gaunt,” says key makeup artist Sandra Linn, who added facial hair and dirt “for his most unkempt looks.” Spooky! In a climate that could change in seconds, cast members like Scott Glenn had to be ready for anything—say, an out-of-nowhere thunderstorm—when filming outside. “The weather is serious in New England,” executive producer–creator Sam Shaw says. “Sometimes in winter, [we were shooting at] 3 o’clock in the morning and it was freezing.” Seems Castle Rock gives everyone the shivers! 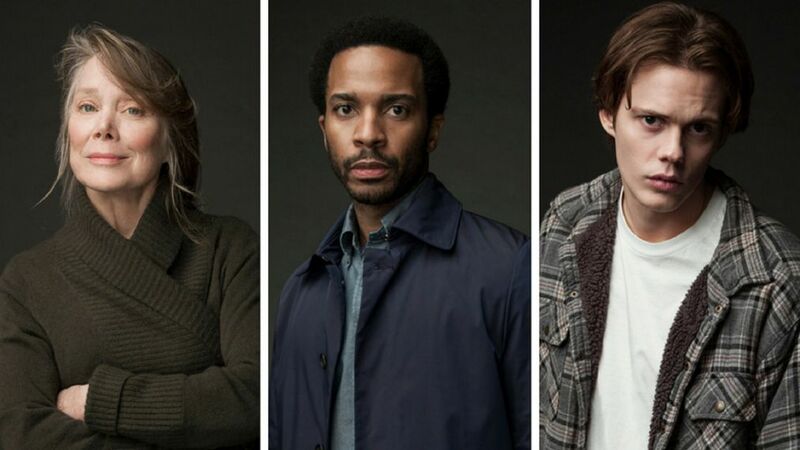 The cast of Castle Rock, this dark, mysterious thriller, had to worry less about things that go bump in the night and more about the fickle, often foul weather of New England. Learn more about the people from this peculiar town.